This is the 2nd of my mini-tutorials in which I focus on patterns. 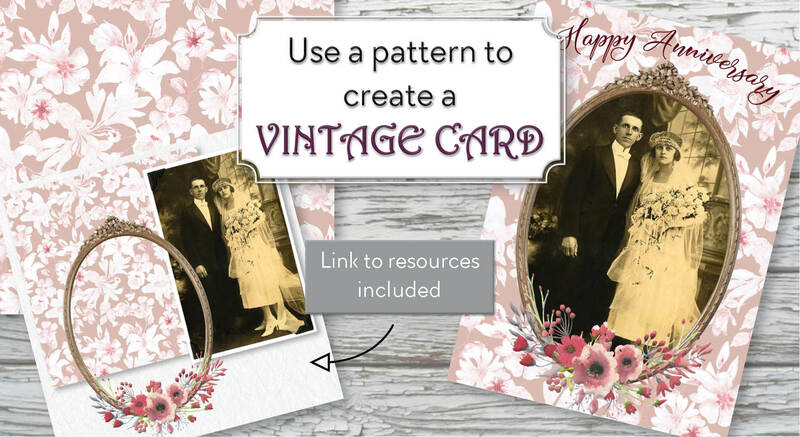 All you need to create the card in this tutorial is contained HERE. Of course, you’re going to use your own photo – one of your kids, grandkids, or you and your husband/partner. I’ve included the stock photo that I’ve used in the tutorial in case you need a photo to experiment with. The creation of this card requires the use of any desktop layout and design program such as Adobe Indesign, or the free alternative Scribus. Another option is to use Photoshop or a similar program; all that’s required is the ability to be able to work in layers. 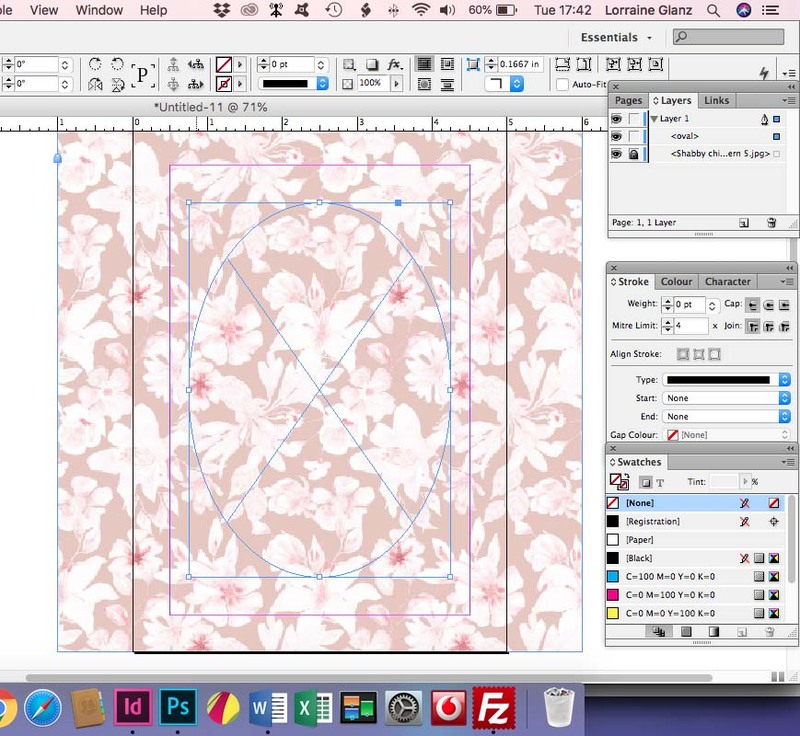 The instructions in this tutorial are for Adobe Indesign. Once again, it’s worth mentioning that my tutorials are aimed at crafters and “would-be” designers who do not necessarily have a thorough knowledge of design (by this I mean that seasoned designers will find my tutorials very elementary!). 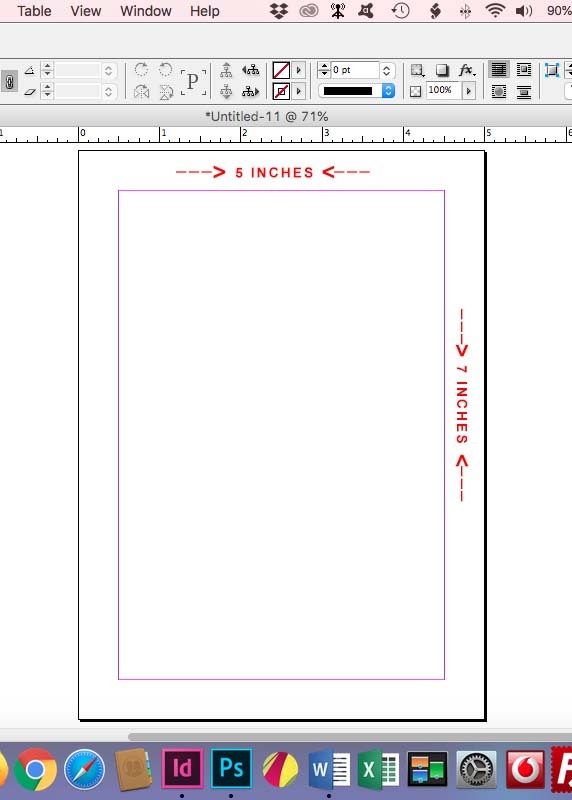 Create a document 5 inches (wide) by 7 inches (high) – see screenshot to the right. Although this is the size of a standard card, you can make your card any size you wish. 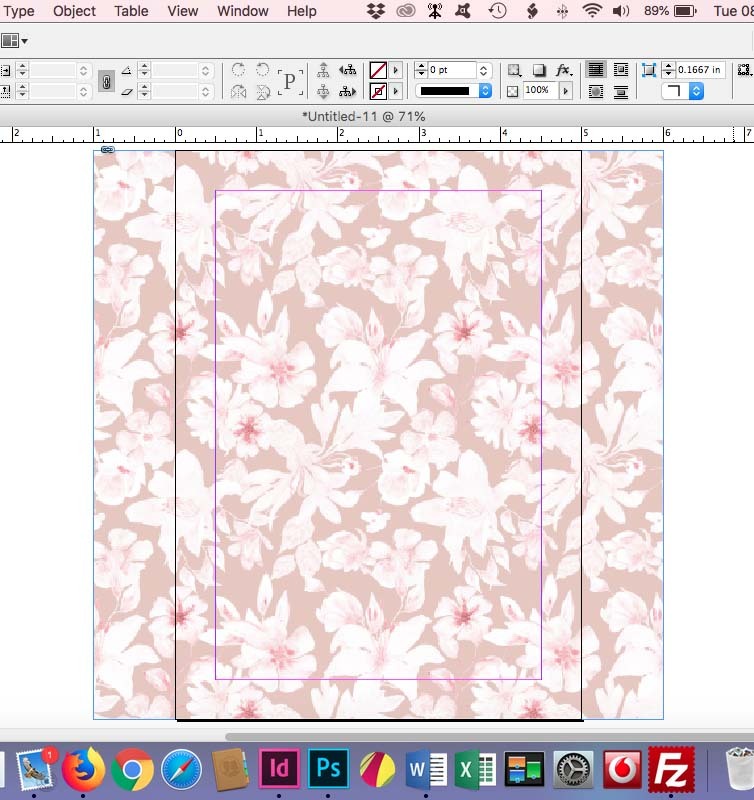 Import (copy and paste or “drag” and “drop”) the pattern provided in the Tutorial Freebie, or the pattern of your choice (screenshot to the left). Most patterns are square, so import the pattern as a 7 X 7 inch square. Centre the pattern and ignore the extra “bits” on each side. 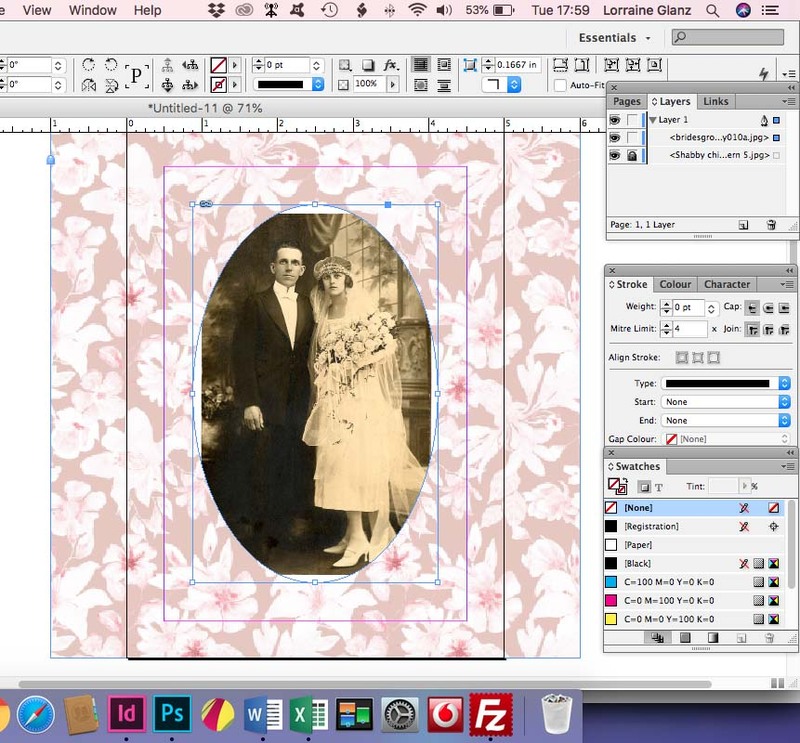 Using the Ellipse Frame Tool, create an oval shape 3.5 inches wide and 5 inches high (screenshot to the right). Centre the oval shape in the page (card). With the ellipse shape selected, insert your chosen photo by using “Place” (under the File menu). Select “Fit content proportionately” under the “Fitting” options (under the Object menu). You will probably find that your photo does not fit the oval shape properly (see screenshot to the left). 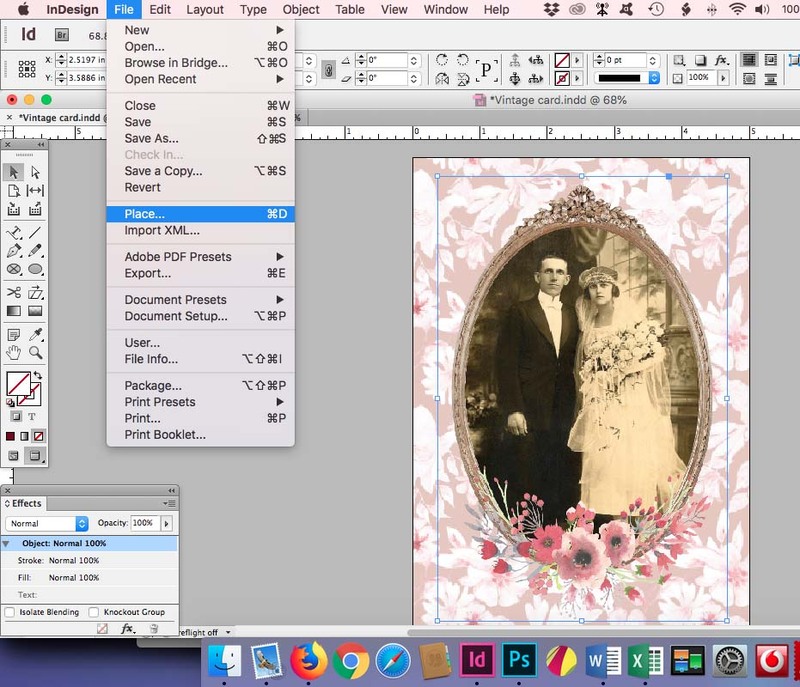 Adjust the size of the photo by using the “Direct selection” tool and enlarging the photo until you no longer have white areas in the oval shape (screenshot to the right). Be sure to keep the proportionality of the photo while you are resizing it, by holding down the Shift Command keys (in the case of MacOS) or the Shift Control keys (in the case of Windows). The final step is to add a decorative frame to the oval, as a finishing touch. 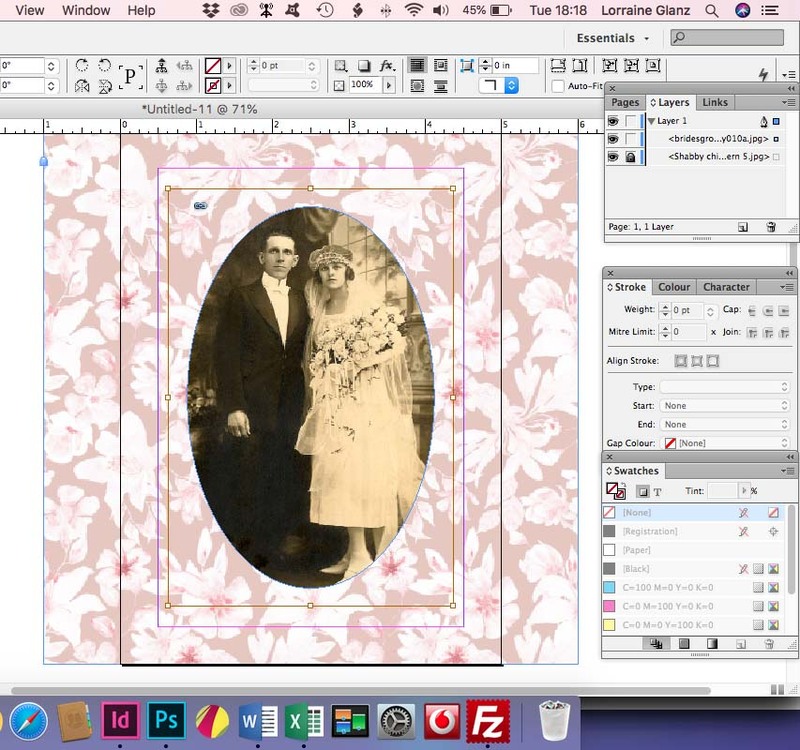 Use the frame included in your Tutorial Freebie, or any frame of your choice. Create another oval using the Ellipse Frame Tool as before. The size should be slighter larger than the oval of the photo. If you use the frame included in the Tutorial pack, this oval should measure 4.3 inches wide and 6.6 inches high. Insert the decorative frame into the oval by using “Place” (under the File menu) (see screenshot to the left). Once inserted, you want the frame to fit perfectly over the photo, so you need to select “Fit content to frame” under the “Fitting” options (under the Object menu). As a final touch, give the frame a Bevel effect by selecting “Inner bevel” under the “Effects” option (under the Object menu). 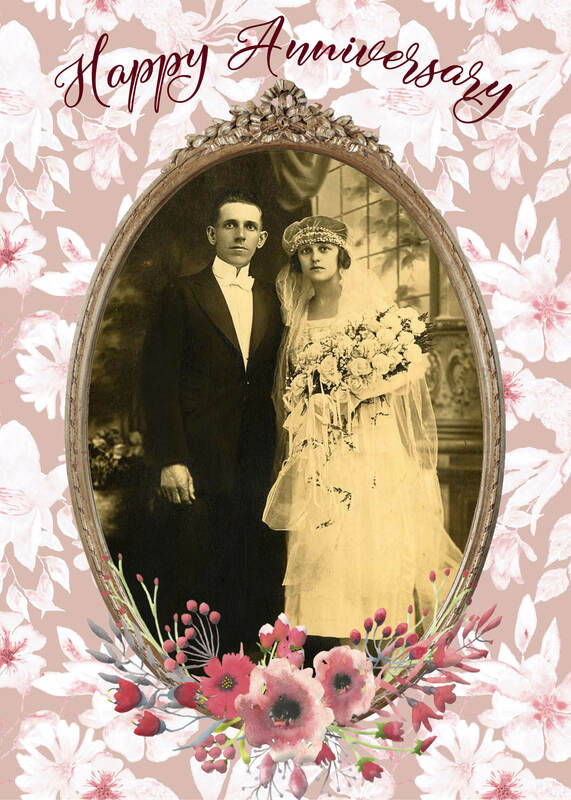 If you wish to add text to your card, you should shift your photo plus the frame lower down on the card so that there’s space for the text above the photo. Here’s the finished card. Have fun, and be sure to contact me with any queries you may have. I’d love to see your finished product. Happy creating!